In this year’s Wines Direct Christmas Brochure, the top chefs and influencers in the Irish food scene shared their much-loved Christmas dishes with you, paired with some festive wines. This week, we reveal their delectable recipes. Whether you are the head chef or kitchen porter at home, we hope you find ideas and inspiration for your own Christmas feast. Chef Gearóid Lynch and his wife Tara are the proprietors of The Olde Post Inn in Cloverhill, Co. Cavan. The award-winning fine-dining restaurant and charming guesthouse is located in the heart of the Cavan’s Lakelands where the couple both grew up. Chef Gearóid Lynch honed his culinary skills at Killybeg’s Tourism College on their Professional Cookery Course. From there he gained his professional experience at Thornton’s restaurant, Dublin, Le Coq Hardi Restaurant, Dublin, the Michelin starred Pied à Terre in London & Lea Linster, Luxembourg. 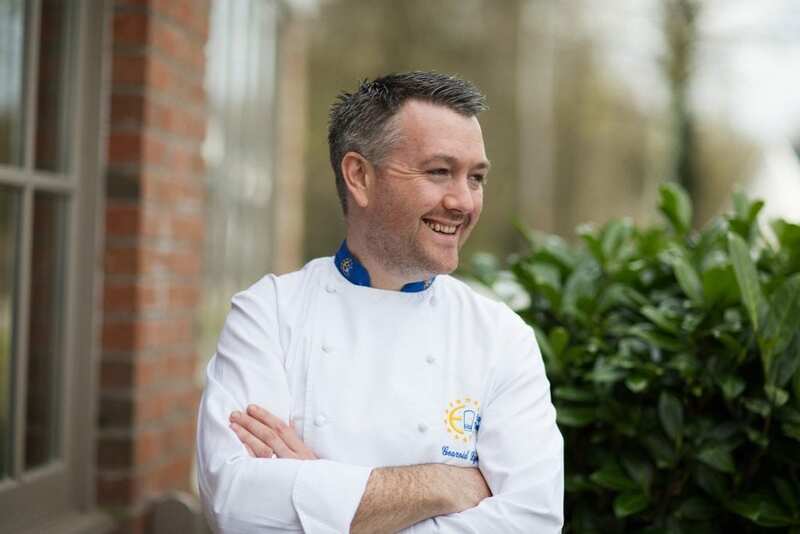 In 2000, Gearóid won EuroToques Young Chef of the Year. Following a diagnosis of Coeliac Disease in 2013, the pleasure of cooking and eating was briefly taken from Gearóid. With very little gluten-free food readily available it presented a monumental challenge in his life and career. Gearóid learned everything he could about his condition and began to re-imagine all the meals that he has missed. Having found the joy in cooking again, Gearóid is sharing his experience in his recent book, ‘My Gluten-free Kitchen. The cookbook is full of delicious tried and tested gluten-free recipes that are easy to prepare and share. Is there a better way to start the Irish Christmas feast other than a modern twist on the traditional Bacon and Cabbage? The terrine is an impressive presentation and will wow your guests from the get-go. We love the versatility of this dish and its ability to pair with most menu items. 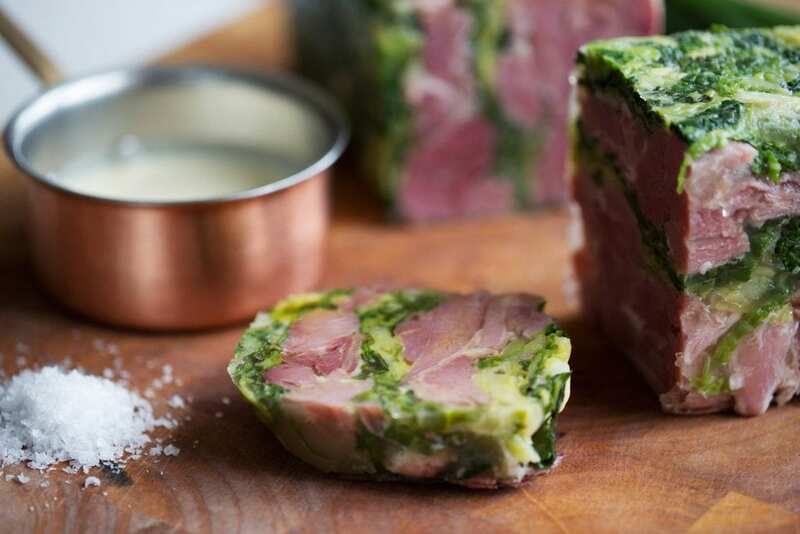 The terrine can also be made ahead of time to help alleviate any Christmas Dinner stress. The recipe includes the usual ham hocks and cabbage but festive additions of star anise, cardamom seeds and baby leek cream introduce mouth-watering depths of flavour. Chef Gearóid Lynch’s starter is a captivating mix of ingredients. Our wine experts found this pairing to be an exhilarating challenge. The terrine’s blend of salt, sweet, spice, fluffy cream and dense texture takes this dish to level ten deliciousness and calls for wines equal in measure. Feudo Luparello, a blend of Grillo and Viognier is another incomparable wine from Sicilian winemaker Walter Bartolomei. The refreshing tropical fruit notes counterbalance the salt of the ham hocks and quells any heat from the spice of the star anise and cardamom. A superior pairing is Domaine Ricard ‘Tasciaca’. Maverick winemaker Vincent Ricard loves to buck a trend and gently ages this Loire Sauvignon in Oak, lending it the power to match the body and texture of the terrine. The acidity of both wines will brilliantly cut through the cream and salt. Place the ham hocks in a large pot with the bay leaf and star anise. Cover with water and bring to the boil, then reduce the heat and simmer for 3 hours, until the meat is falling off the bone. Remove the hocks from the cooking liquor using a slotted spoon and let them cool slightly, remove the bay leaf and star anise, retaining the cooking liquor. Pick the meat off the bones and remove any gristle or fat. Prepare 2 terrine tins or 2 lb loaf tins by lining them with several layers of cling film, letting the excess hang over the sides of the tin in order to wrap up the contents later on. Blanch the prepared cabbage by boiling it in the cooking liquor from the ham hocks for 3–5 minutes. Once cooked, strain the cabbage but still keep the cooking liquor for setting the terrine. Fill the tin with alternating layers of ham and cabbage until the contents sit over the top of the tin by 2.5 cm. Pour the cooking liquor over the terrine, ensuring the last layer is covered. Wrap the terrine with the overhanging cling film, keeping it tight. Place the tins on a tray or plate, ensuring it is level, refrigerate overnight with a heavy weight placed on top to press the terrine. It is very important that the terrine is firm and set before removing it from the tin – it can take up to 24 hours to set properly. To prepare the leek cream sauce, melt the butter in a medium-sized saucepan over a medium heat. Sweat the onion, celery and leek for about 5 minutes, then add the cream, bay leaves, star anise, cardamom and peppercorns. Bring to the boil, then reduce the heat to low and simmer for 5 minutes. Remove from the heat and allow to stand for 15 minutes, then pass through a fine-mesh sieve and discard the solids. Taste to correct the seasoning, then stir in the chopped chives and keep warm. To serve, preheat the oven to 175°C. Cut the terrine with a sharp knife into slices 2 cm thick and place on a baking tray. Cook in the oven for 3–4 minutes, until it is only just warm, not overheated, or it will fall apart. Place a slice of the terrine on a warmed plate and spoon over some of the leek cream. Orange Wine – What is it?